MERRY CHRISTMAS FROM 2ND E !! MERRY CHRISTMAS FOR THE RESIDENCE HALL !! Today some pupils and some teachers have been to the residence hall in order to motivate them in this Christmas time. 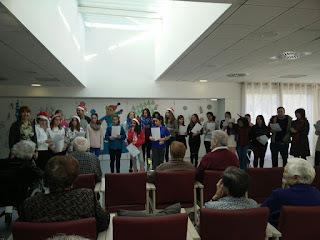 We were singing carols organized by the Religion teacher. NOW ALL OUR STUDENTS ARE WORKING ON SUSTAINABLE DEVELOPMENT. IN ORDER TO REFLECT ABOUT OUR HUMAN RIGHTS, THE STUDENTS OF 4TH ESO HAVE BEEN WORKING ON IT WITH THE TEACHER SONIA HERRERO. 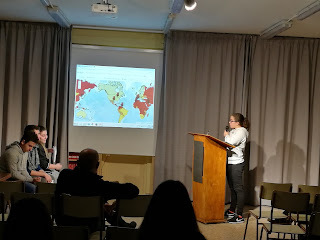 AND THEY HAVE PRESENTED IN RECREARTE, SOME EXAMPLES OF SITUATIONS IN WHICH THESE HUMAN RIGHTS ARE NOT RESPECTED, fOR EXAMPLE, RAQUEL WAS TALKING ABOUT AN ILLEGAL DETENTION OF A BLACK MAN IN USA WITH ILL TREATMENT FROM THE POLICEMEN. UNFORTUNATELY NOT MANY PUPILS WERE PRESENT. MAYBE THEY DON'T PAY ATTENTION TO WHAT THEY HAVE BUT MIGHT NOT HAVE ONE DAY. 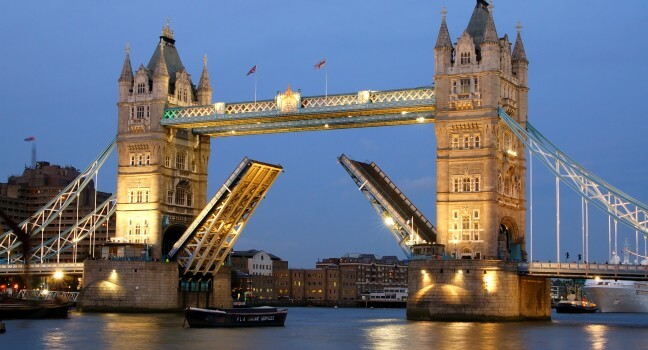 AS EVERY YEAR... WE ARE GOING TO LONDON AGAIN !! THIS TIME 20 STUDENTS FROM BTO AND ADM. WILL PARTICIPATE IN OUR MOTIVATION TRIP FOR CHRISTMAS, AFTER THE EXAMS FROM THE 15TH TO THE 19TH OF DECEMBER 2016. WE WILL POST SOME PHOTOS ON THE WAY BACK. 3rd ESO students show their bilingual presentations of our school and their different villages that they have been doing in the English and French lessons with their teachers M. Mateos and I.Sancho for RECREARTE and for the ERASMUS+ students. VERY HUMAN VIDEO FROM ITALY THAT YOU SHOULDN'T MISS !!! Gracias por su mensaje. Me llamo Bernd Rüppel, soy profesor de economía y actualmente trabajo en la dirección de la escuela FOS / BOS Erlangen. 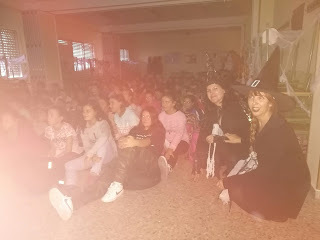 En la escuela FOS / BOS Erlangen es posible ver a los alumnos que hacen prácticas técnicas cerca de la escuela. Los alumnos que hacen prácticas económicas están en empresas de la région. Solo es posible ver a uno de esos alumnos cuando el profesor responsable está visitando la empresa de vez en cuando. Así solo podemos ofrecer a su compañero /a ver a los alumnos que hacen prácticas técnicas. Pero claro, él o ella puede asitir en clase de economía o de español, si lo quiere. 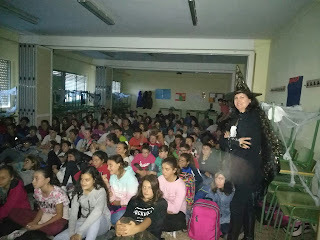 Sería un placer recibir la visita de su compañero / a para intercambiar experiencias. YES, THEY DO .... IN YOU TUBE... WITH A LOVELY VIDEO PRESENTATION ... TO GET IN TOUCH AS PART OF THE ERASMUS+. THEY BELONG TO A GYMNASIUM IN ERLANGEN. 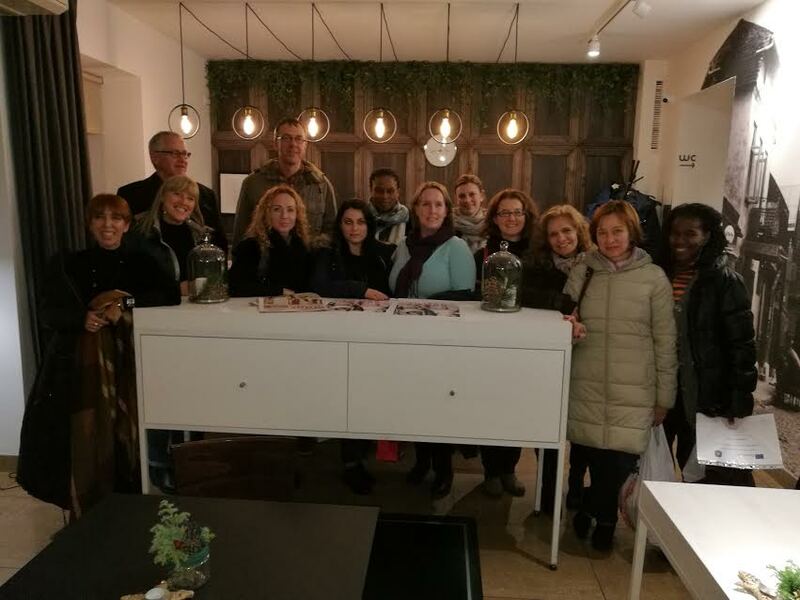 14 TEACHERS MET IN LITHUANIA ( 20-24 NOVEMBER 2016) TO ORGANISE OUR ERASMUS+ "GREEN JOBS". WE HAD A LOVELY TIME !! They will all come to Utebo in March 2017 (18-26) to visit our enterprises related to the protection of the environment, such as ZETRUZ, which is in charge of recycling, the clean spot in Utebo, and the water purifying plant to avoid toxic liquids into the river Ebro. Each country will investigate in some fields and we will share interviews and interesting matters in order to create a future guide for our students, with all kind of possible 'green Jobs'. We are looking forward to the event. 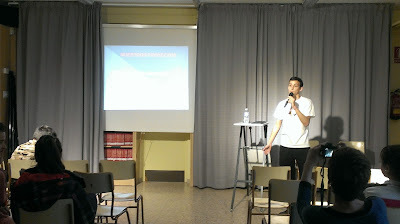 We already started working on presentations of our schools and villages in October. Then, 2 teachers and 5 students will travel to U.K. in April to carry out our presentations. 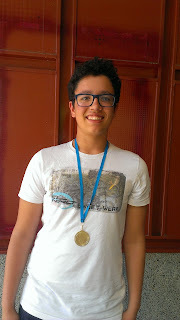 - My interests/hobbies are piano, singing and gaming. - My favorite thing to do is to sleep. - My favorite food is tom kah gai. - My idol is Demi Lovato. - My favorite subject in school is English. 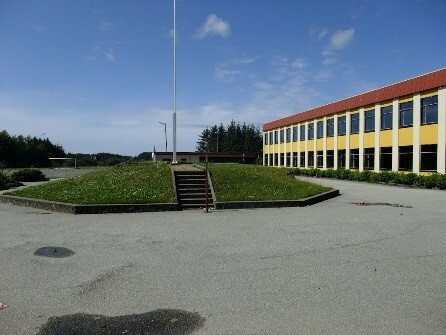 - Bømlo is an island with beautiful nature. - The best about Bømlo is that it is such a beautiful place. - Norway is a country filled with beautiful nature. 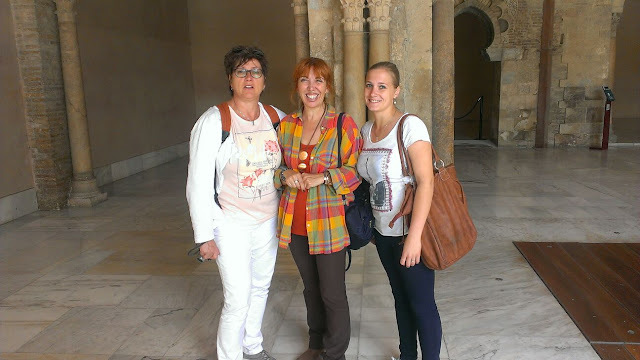 MARGA HERRERO AND INES SANCHO ARE GOING TO LITHUANIA TO ORGANIZE THE RASMUS+ ' GREEN JOBS'. FROM THE 20TH TO 24TH OF NOBEMBER. 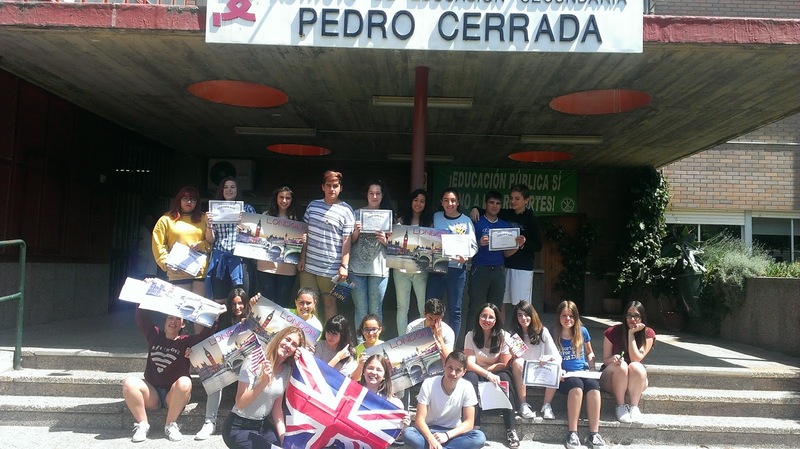 A GROUP OF TEACHERS AND STUDENTS WILL COME TO VISIT UTEBO IN MARCH AND THEN, WE WILLALL GO TO U.K. TO EVALUATE THE TASKS THAT HAVE TO BE CARRIED OUT. 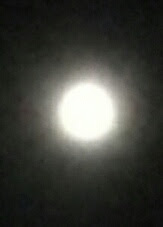 YESTERDAY NIGHT, WE WERE ABSOLUTELY CLOSE TO THE MOON, CLOSER THAN WE USUALLY ARE. tHAT'S WHY WE COULD SEE IT SO BRIGHT AND BIG AS IF IT WAS A 3D IMAGE. 0 M G ... TRUMP? NO THANKS !!! 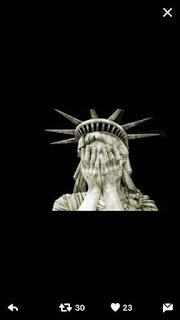 TRUMP FOR PRESIDENT OF THE USA? NO, THANKS... NOT WITH THAT VOCABULARY .... DID YOU LISTEN TO HIM?? This month, the moon will be bigger after sunset. 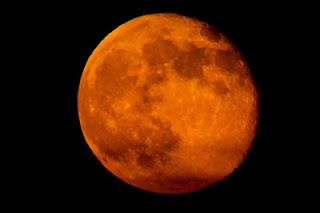 On 14 November, the moon will be closer to the earth. The last time the moon was so close was in 1948. Also, this month, we can see a meteor rain the Taúridas on 11th November and Meteor Rain Leónidas on 16th November. To enjoy this show, go to a remote place where you can clearly see the sky. -A 1971 Lamborghini Miura owned by rock legend Rod Stewart was sold by auctioneers Coys international for a price of 909,000 pounds (1, 006,535 euros) in the first Classic & Sports Show held at the Alexandra Palace last Saturday of London October 29 Miura jumped on stage at the car show being more valuable to sell at auction. This model P400S had undergone a restoration worth 100,000 pounds (110,740 euros) and upgraded to SV specification. Chris Routledge, Managing Director of Coys Director stated that "in relation to the high quality displays and spectacular parades live Friday, Saturday and Sunday, as well as the inclusion of original models Grand Prix on the streets of London, have made the auction held by Coys has been a success "and said that" the auction has been exceptional, clearly demonstrating that the historical automobile market is alive with auctions as the Maserati Ghibli or the Lamborghini Miura of Rod Stewart. 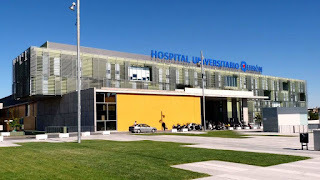 Helios, the German giant owned by Fresenius, has acquired the Spanish group QuirónSalud by nearly 6,000 million euros to create the largest Spanish-German healthcare group in Europe and one of the largest in the world. Despite the integration of Spanish, both brands will remain. This new group will have more than 100,000 employees, while managed 155 health centers. 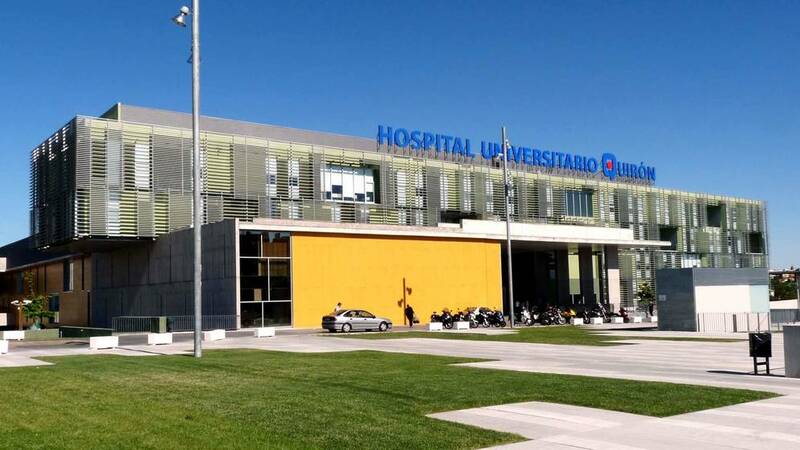 QuirónSalud management remain in the hands of the current team, which will be integrated into the new company to be part of the draft international consolidation. In this sense QuirónSalud direct the project for Latin America. Helios QuirónSalud and share sensitivities, historical trajectory and similar strategies, so that the integration of both companies will be carried out quickly and efficiently. The new group will also provide greater range of services to patients, both Spanish and German, as they will have access to the best professionals, hospitals, and research facilities. Moreover, employees of both companies will have new opportunities for professional development and to be a leader in innovation of medical treatments. The story of princess Anastasia was performed from the Royal Opera House in London by the ballet dancers. it was shown in CINESA live yesterday straight from Covent Garden. It was excellent. It is not clear that the lady was 'Anastasia' as she had amnesia when she was found in a phychiatric hospital, where she presumed she had suffered a lot after she had survived the murder of the Zar family in St Petersburg. HORROR STORIES COMPETITION .......IN CLASS. 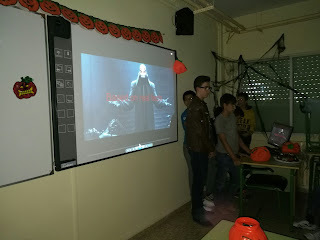 My students were writing ‘horror stories’ last week for Halloween. These are the final prizes. 1st prize in ADM 3: Vanesa Pueyo Bea Arias. IT WAS A DARK NIGHT … on the 31st of October when my boyfriend and I were watching a film on TV. It was a horror film and I was really scared. However, my boyfriend, who likes horror films, was laughing at me. Suddenly, we heard strange noises in the garden and the dog started barking. We went out to see what was happening but there was nothing. It looked like an ordinary night and we continued watching the film. Shortly after, we heard again the noises and we could see a ghost through the window. It was playing with our dog… my God !!! We went out again, but the ghost had disappeared in the dark night. On the following day, our neighbour asked us about the previous night and the shouts in the garden. Immediately after, he started laughing at us and he admitted he was the ghost that had scared us. Just then, we realized he had been pulling our leg. 1st prize in 1st BCT : Ana, Rafa and Dulce. IT WAS A DARK NIGHT when….. Tom heard a strange sound in the basement of his house. He was by himself so he decided to go to the kitchen and pick up a knife. He stopped and listened to the noises. They were louder and louder. Tom followed the noises and he realized they were coming from the cellar. Carefully, he opened the door a little bit and he saw two red flashing lights. Tom, frightened asked if there was somebody there, but he got no answer so, he asked again without any success. He tried to turn on the lights but they didn’t work. Finally, Tom decided to go downstairs and deal with whatever that thing was. Suddenly, when he was close to the ‘thing’, it jumped on him and bit his leg. He started to scream and then, …. ‘Tom, Tom, wake up !!! It was his mother, who was worried about him. “What has happened?” She asked, “I had a horrible nightmare” He answered. “Something strange had attacked me”. Then, Tom looked at his hand and realized that he had hair growing up everywhere. 1st prize in 1st BCSS: Maria Gesse and Maelle Truet. 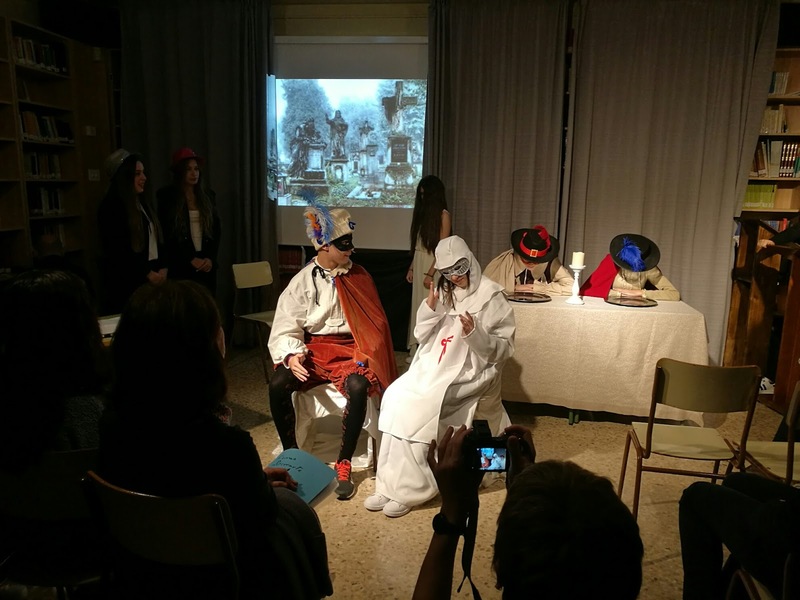 IT WAS A DARK NIGHT when the best pupils in College decided to finish their scientific investigation about how mentally ill people were treated in mentally ill hospitals. For that, they went to the only hospital existing in town who had been abandoned for 20 years. When they went in, they only saw hospital beds in the corridors, since all the rest was quiet. They continued walking and suddenly, the door closed. They didn’t mind, so they kept walking while they were looking for the medicine room. Then, they saw a woman hung. All of them started screaming and ran. They couldn’t believe it!! When they went back to check, the woman without eyes was not there anymore…. They thought it was only their imagination. Some minutes later, one of them went to the bathroom and there, he saw the same woman chained to the shower! He ran out to warn the others and they all were panicking to the exit. All that was too much for them. 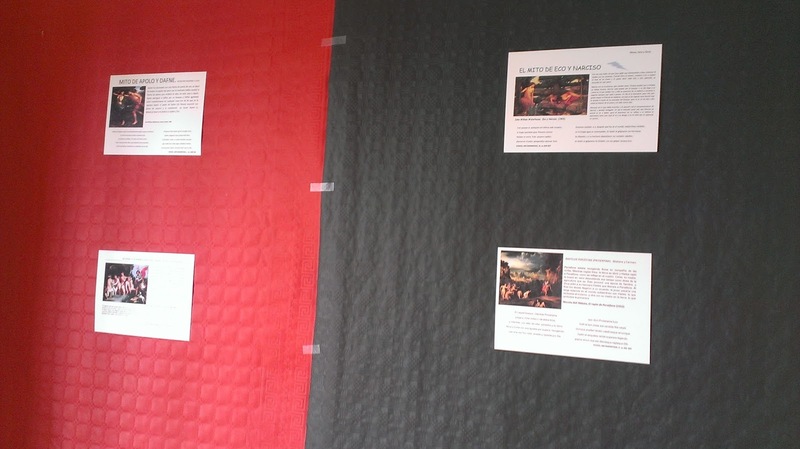 However, they didn’t notice that one of them was missing…. When they realized, it was too late for all of them…. TO BE CONTINUED……. MY FAVOURITE MUSIC IS ' THRILLER' BY MICHAEL JACKSON. 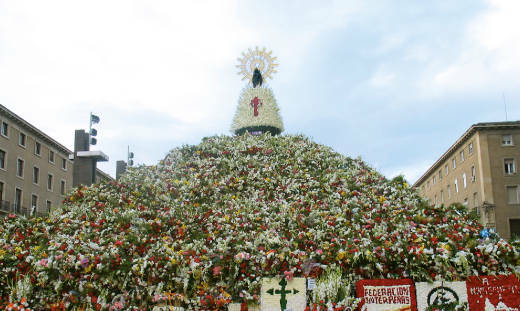 People come to Zaragoza from alL over the world, for the offering of flowers, concerts, typical dancing, typical food, fun fairs, and a lot of fun. During the Pilar Festival, a group of teachers went to Liverpool and we enjoyed the Beatles places and the Cavern where they started singing. 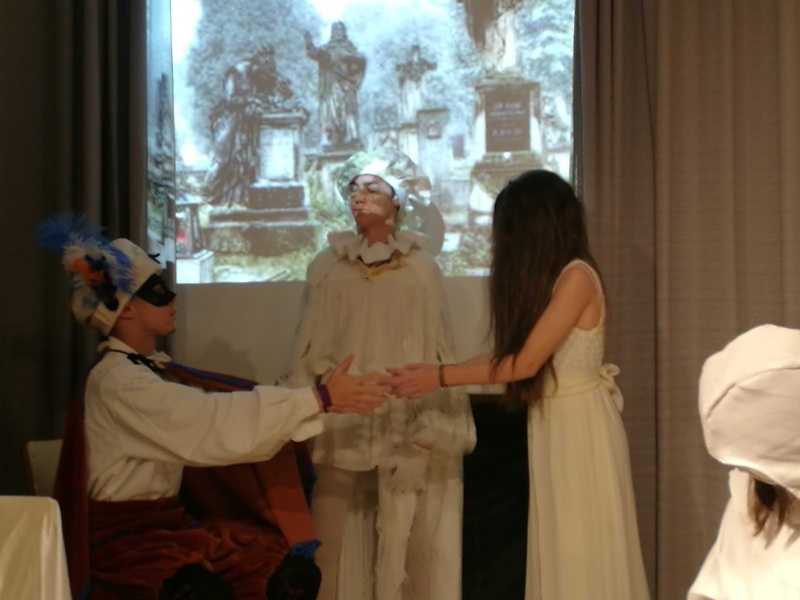 We are very proud because our efforts week after week in the RECREARTE sessions during the breaks on Tuesdays has been awarded with a cheque of 12,000€ so that we are able to use them for materials and everything we need to go on with our work. 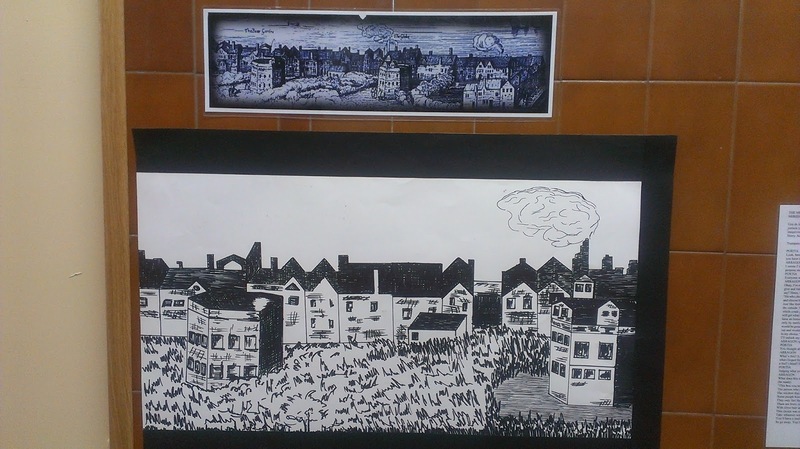 pupils and teachers are invited to participate and develop their creativity. 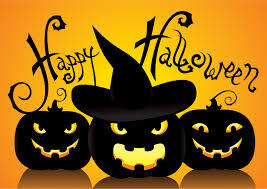 We are already thinking about Halloween..... and a bit of Horror... !!! 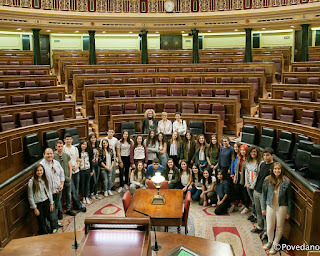 Students from 1st BHCS together with Administration third year went to Madrid with Lola and Ana. 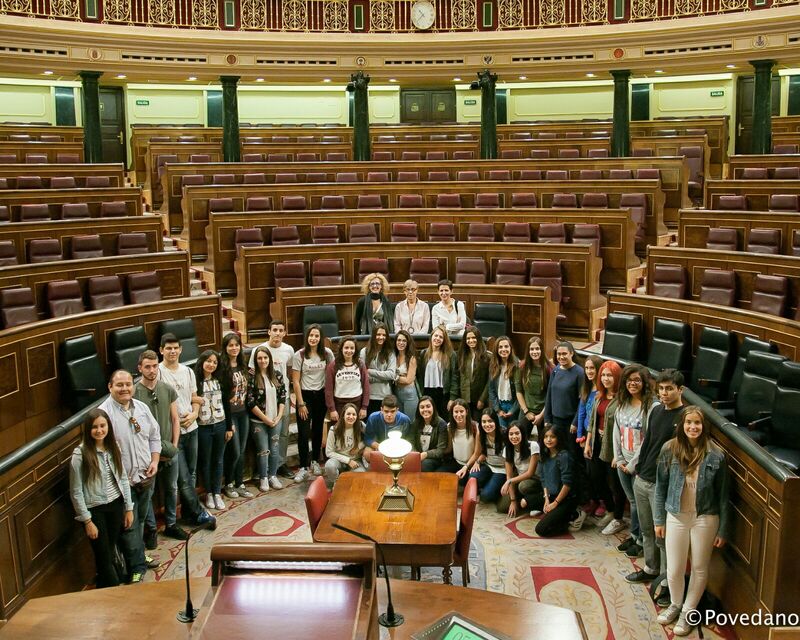 They visited the Parliament, the Senate and other interesting places. 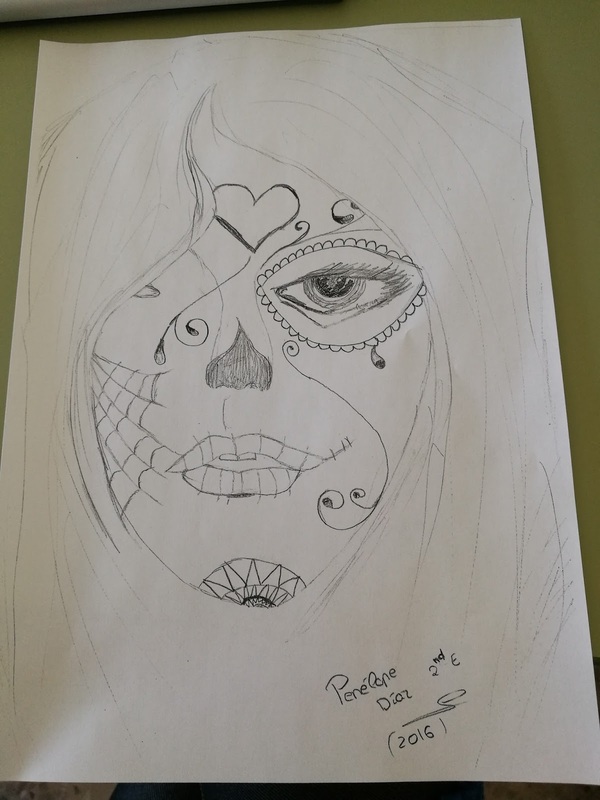 My name is Penélope Díaz from 2nd E and I like drawing very much. 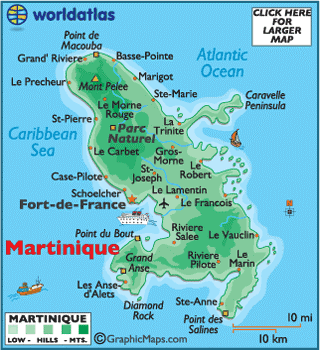 I WAS BORN IN ILE DE LA MAYOTTE NEXT TO MADAGASCAR. 6. HOW MANY BROTHERS AND SISTERS HAVE YOU GOT? 7. DO YOU HAVE ANY PETS AT HOME? NOT AT HOME, BUT I HAD A FARM IN Mayotte. 8. DO YOU HAVE A CAR? 9. DO YOU LIKE FOOTBALL? 10. WHAT DID YOU STUDY? I STUDIED ADMINISTRATION TRAINING COURSE. 12. WHO DO YOU LIVE WITH? I LIVE WITH MY BROTHER AND HIS WIFE. 13. WHAT IS YOUR FAVOURITE ANIMAL? 15. WHAT IS WHAT YOU LIKE MOST IN SPAIN? 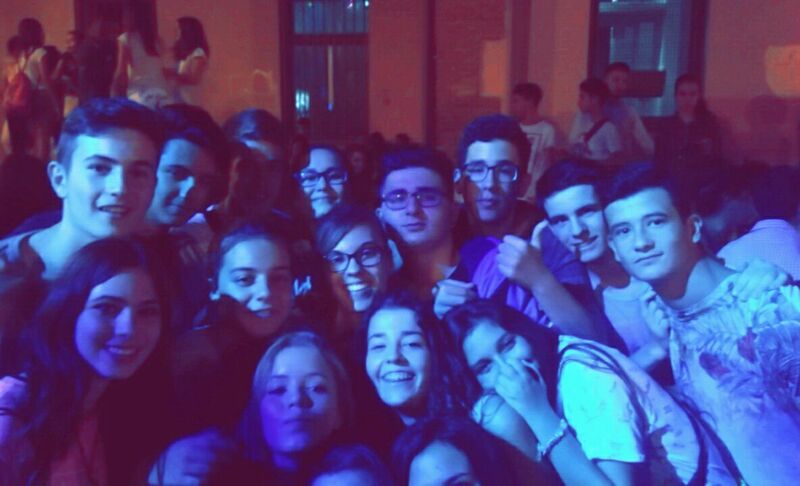 SPANISH OMLET AND PEOPLE . Some of the students of Pedro Cerrada are very happy after the festival in Casetas, where they really enjoyed for a few days with so many different activities. PROJECT ABOUT REFUGEES IN LECCE ... ITALY !! Together with the history teachers, we were making interviews to all the foreigners at our school, over 30. 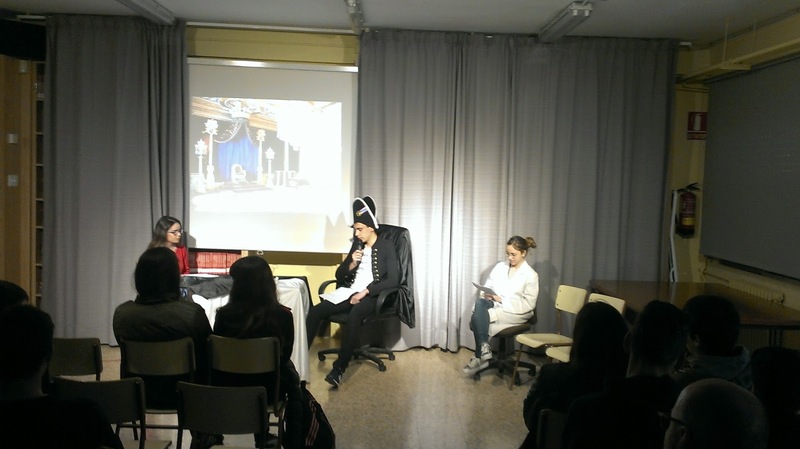 Then, the students, Lorena, Sele and Nerea were helping me to summarize them. Then, in June, we had to video record some short clips to take to Italy and finally, we travelled on the 20th of September to Lecce, where we met students and teachers from Holland, Germany, Belgium and Italy. 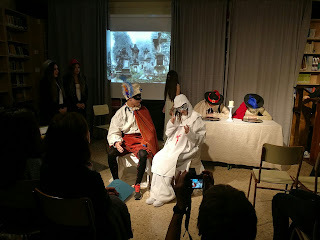 The students had to work hard for 3 days in order to make a documentary film with all the materials. In the afernoons, we could visit the places and beaches around. We had a lovely time and we got the first prize thanks to Lorena Tolosa and her group. On the last day, they were playing 'wolves and villagers.... as you can see in the photo. HELLO AGAIN AFTER SUMMER HOLIDAYS...... THEY WERE SHORT, WEREN'T THEY? 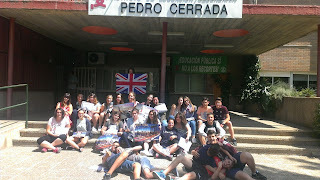 HERE WE ARE THIS YEAR WITH OUR ADVENTURE IN ENGLISH ... AS USUAL. ** THE TOPIC IS "GREEN JOBS"
SCHOOL YEAR IS FINISHED AND WE ARE GOING TO HOLIDAYS FOR 2 MONTHS. RELIGION STUDENTS WENT TO UNCASTILLO .. 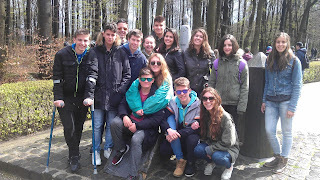 Religion students went to Uncastillo with their teacher as they do every year because it is a very rich village culturally speaking and has got a lot of Romanic churches as it was a very important village in the 12th century. They also visited the local council which has Renaissance features. They go on a picnic and they enjoy a lot. As every year, we are happy to get to the end of the school course, but unfortunately, some teachers have to leave... like Carmen, Teresa, Montse, Siro or Carlos Abellan because they had a contract. Besides, Carlos got married and had permission to travel to Japan and Singapur. Some others, asked to move to another school, mainly to avoid driving every morning from Zaragoza to Utebo. So Marian, the history teachers is moving to Goya School, Sara Sin is moving to the school in Magdalena area and also Olga too. 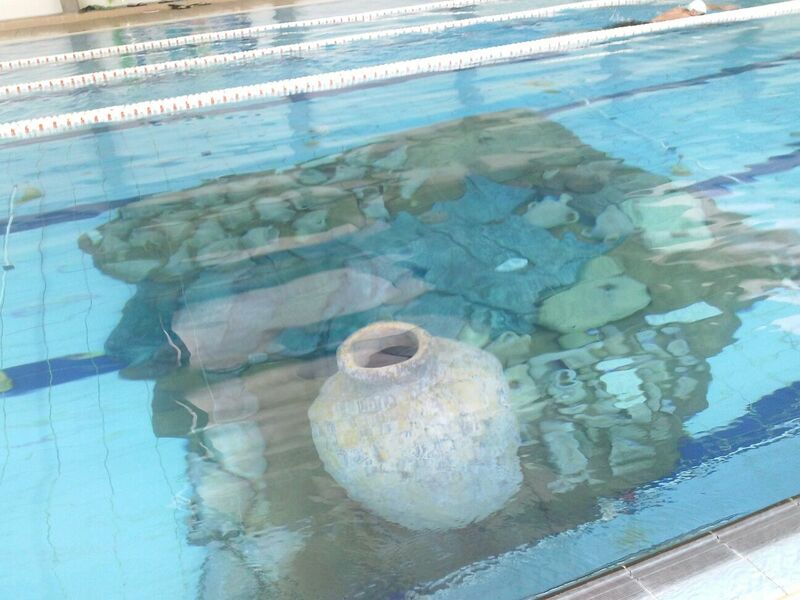 THE PHYSICAL EDUCATION DEPARTMENT TOGETHER WITH THE HISTORY DEPARTMENT ORGANIZED A VERY INTERESTING ACTIVITY ON THE 31ST OF MAY IN THE INDOORS SWIMMING POOL OF UTEBO WITH THE PUPILS OF 1ST YEAR OF ESO. 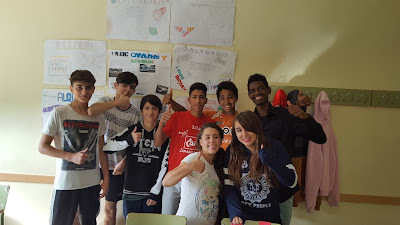 42 students from 4th ESO are travelling to Portugal next Thursday from 16-21 June 2016 accompanied by the teachers Antonio Romero and Carmen Vicente. I hope they can bring a lot of photos related to their activities there. OPTION A WAS RELATED TO WASTING FOOD AND CREATING RUBBISH WHICH POLLUTES THE ENVIRONMENT. OPTION B WAS RELATED TO MUSIC DURING THE NAZIS PERIOD. CONGRATULATIONS.... I HOPE YOU CAN GET THE CERTIFICATE. i AM VERY HAPPY TOO BECAUSE I HAD THE OPPORTUNITY TO COLLABORATE WITH THEM AFTER SOME TRAINING COURSES AT UNIVERSITY. THIS YEAR, PROBABLY MORE PRESENTS THAN EVER for all the participants in the European competition organized by the University of Cambridge. 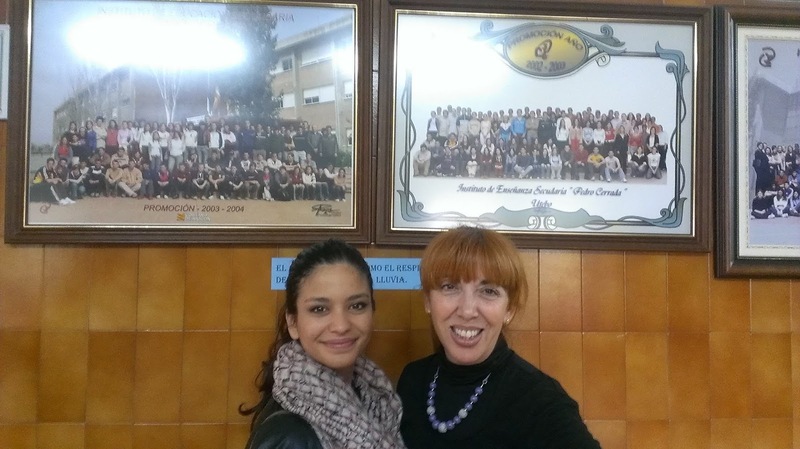 AND ONE STUDENT FROM 1ST ESO : ALBA BENAGE FROM 1ST A GOT A SPECIAL AWARD BECAUSE SHE GOT 344 POINTS OUT OF 350 SO SHE GOT THE 3RD POSITION AMONG ALL THE DIFFERENT SCHOOLS IN THE COUNTY OF ZARAGOZA. ... YES THEY DID!! 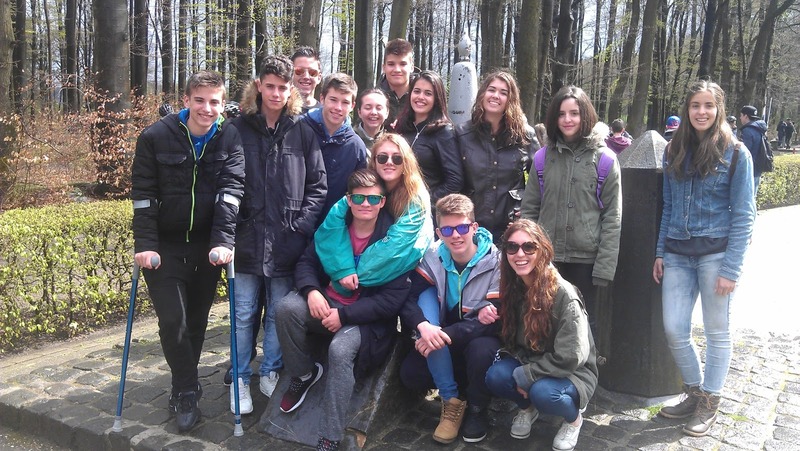 THEY TRAVELLED TO ALQUEZAR WITH THEIR 5 TUTORS ON THE 22ND OF MARCH. THEY ARE HAVING A WONDERFUL TIEM .... since they arrived last Wednesday, when they did the sightseeing tour to get to know the city. They are the Dutch teachers, Elizabeth and Rachel from Gulpen. No.... it wasn't Ala Triste... it was Costin ... the pupil most fond of the character Ala Triste, as he has read all the books written by Arturo Pérez Reverte. 14 STUDENTS FROM THE NETHERLANDS WILL ARRIVE ON THE 18TH OF MAY..
14 STUDENTS AND 2 TEACHERS FROM GULPEN (THE NETHERLANDS) WILL ARRIVE AT THE SCHOOL NEXT 18TH OF MAY FOR A WEEK. THEY WILL ATTEND SOME LESSONS IN ORDER TO PRACTISE SOME ENGLISH. IT WILL BE POSITIVE FOR OUR SPANISH STUDENTS. THEY WILL GO TO THE FUN FAIR ON THE HILL. WE WILL GO TO VILLANUA TO VISIT THE bRUXAS CAVE, THEN THEY WILL PARTICIPATE IN THE 'TIROLINAS' EXPERIENCE. LATER, THEY WILL SPEND THE AFTERNOON ICE-SKATING. 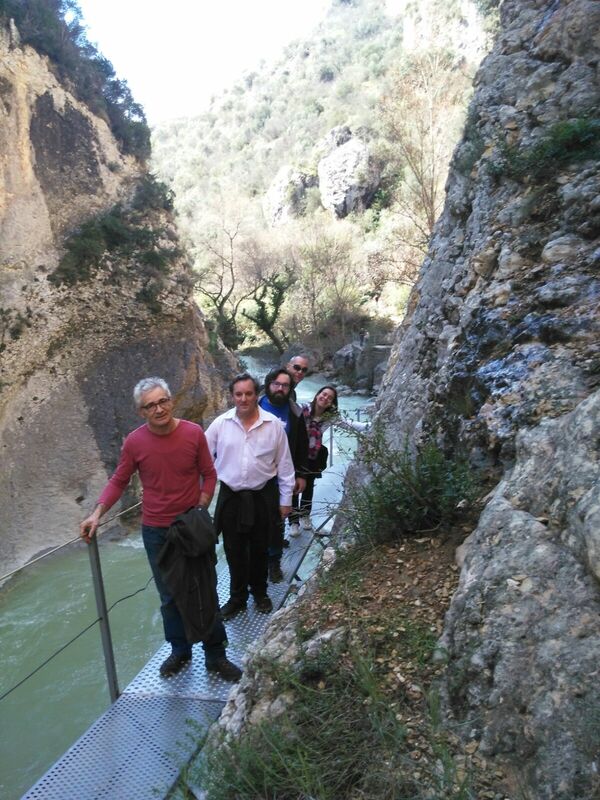 THE TEACHERS WILL VISIT THE RIVER PIEDRA NATURAL PARK. WE WILL HAVE A WONDERFUL TIME TOGETHER. RECYCLING .... ARE YOU INNTO IT??? WE HAVE BEEN WORKING ON RECYCLING INSIDE THE CLASSROOM OF 3RD A-B WITH THE HELP OF THE 'MASTER' STUDENT, MONTSE. It all started after the visit to ZETRUZ, the reclying plant for the Local Council of Zaragoza. There, we learnt that it is important to do it correctly... because if we don't do it correctly ... it is better not to do it. 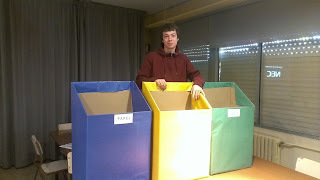 Also, in RECREARTE, the students were talking about it and simulated to distribute the different rubbish into the different containers. Now, we have set up the boxes at the entrance of the main hall. Because it is the 400 anniversary since the death of William Shakespeare, the students have been drawing with the Art teacher inside the classroom, trying to imitate some of the pictures from his plays. 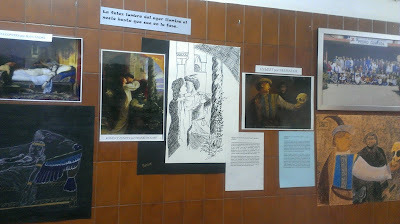 Then, the exhibition in the corridor is fantastic. 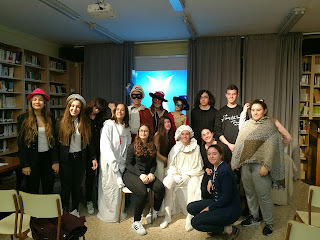 The imitations are great thanks to the teacher Encarna and the effort of the students. 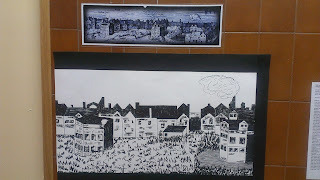 This is the image of his home town. In the English classroom, we have been talking about his biography and his plays. Then, we were watching one of his plays which was taken into the cinema: Tristan and Isolde. Our Napoleon was at the libary for an interesting interview at a RECREARTE session in French of course. We laughed a lot !!... Do you guess who he is?? 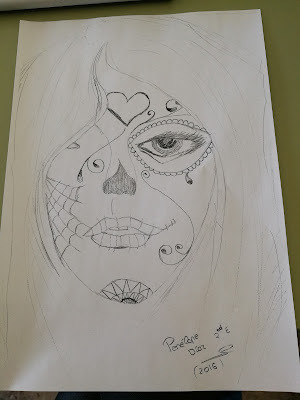 Then, the other student from Bachillerato, the girl. pretended to be Marie Curie, who made a great effort to equal her husband in his reserach of the Radio. She died from radioactivity damage. 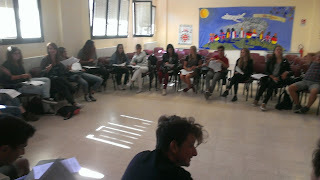 so during the RECREARTE session, students and teachers were reading lovely poems yesterday in this occassion, by Aragonese Writers. 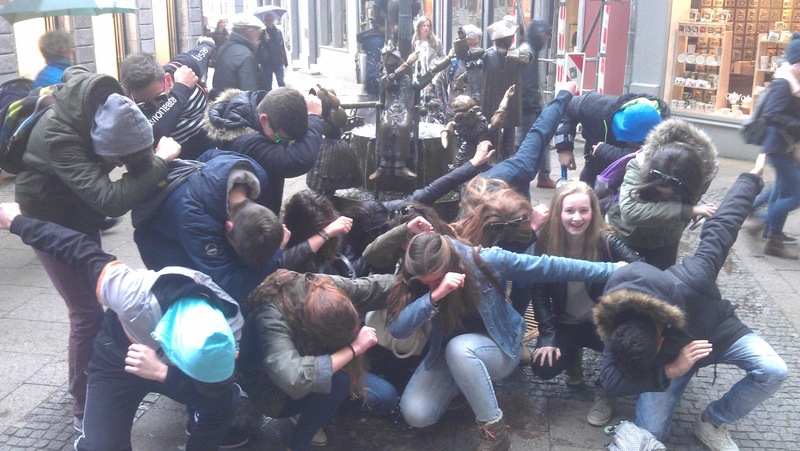 Or students are sending photos from The Netherlands. They travelled to Gulpen which is a nice town neqar Maastrich. An ex-pupil of mine Zineb Zeyad has just come to school to say 'hello'. She is studying Journalism in Paris at the moment and she is very happy living there. She can speak French, Arab, Spanish, English and some Italian so I think she can be a very good 'freelance' when she gets her degree. She loves singing and she has promised to come one day and ring at RECREARTE. HER FAVOURITE SONG IS 'AT LAST' by ETA JAMES. 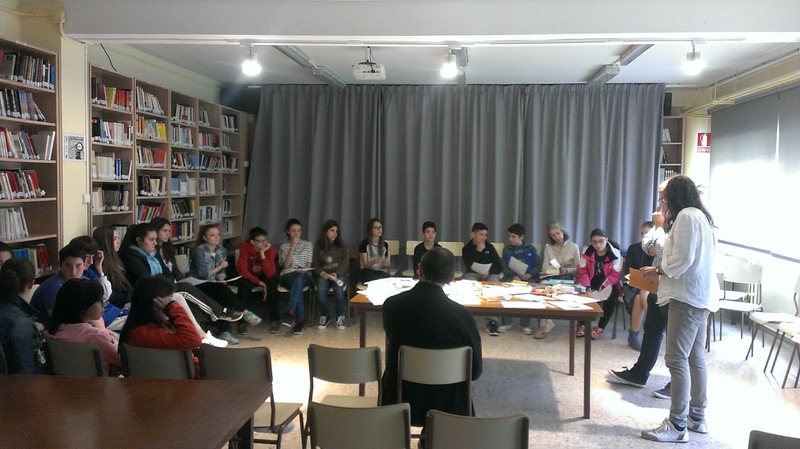 Last Thursday the 14th of April, the pupils of Arts were designing and making different things in the art workshop for 5 hours. They made pencil cases and lovely folders with beautiful decorations. 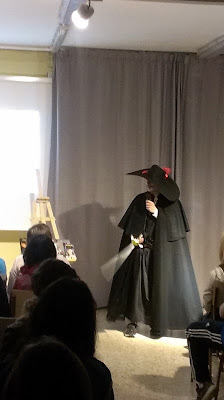 Here is an example sent by Carmen Fernández. 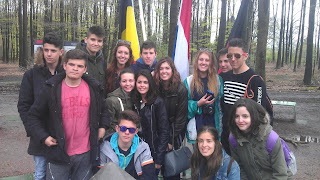 At last, our students have travelled to The Netherlands with Ines and Manolo. 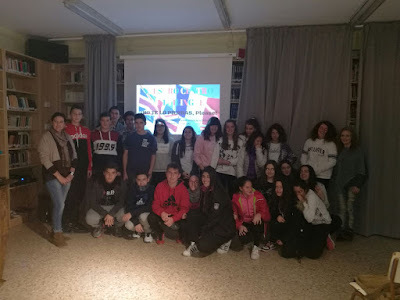 14 students from 3rd -4th ESO and Bachillñerato will be spending a few days in Gulpen from the 15th to the 20th of April togethere with another group of students from IES Tiempos Modernos from Zaragoza. 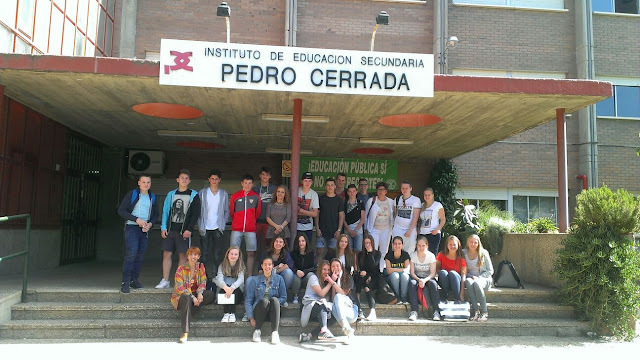 Then, the Dutch students will come to Utebo on the 18th of May. It is part of the 5-year-agreement which we have with The Sophianum School and other European schools in order to work in several projects. COCA COLA SHORT STORIES COMPETITION IN SPANISH. Irene Villalba, Laura Gabelas, Paula Martínez and Valeria Quintana from 2nd ESO participated with their language teacher Montse in the Coca Cola Short stories competition that took place in the Faculty of Law. Thanks a lot to all of them for such an interest. On Tuesday, as part of RECREARTE,our pupil Pablo Alonso from Administration training Course, showed in the library, many activities you can all participate in to show solidarity. He is working for several NGOs at the moment, like OXFAM INTERMON, so that more and more people can collaborate donating time or money to the people in need in developing countries. You can also sponsor a child or buy in the Fair Trade shop in Leon XIII, 24 in Zaragoza. A GROUP OF OUR STUDENTS FROM BACHILLERATO WENT TO THE PHILOSOPHY FACULTY IN ORDER TO PARTICIPATE IN THE GEOGRAPHY OLYMPICS... SO I WISH THEM A LOT OF LUCK. This app created by Irontec and The Makery won first prize in the competition of Open Data Euskadi, organized by the Basque Government. 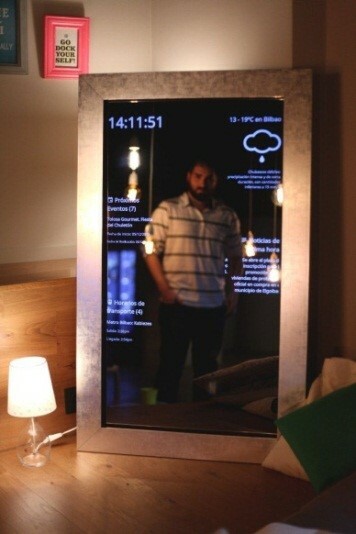 This application, created jointly by The Makery and Irontec, transforms the traditional mirror in a digital signage tool that allows provide relevant open data information on weather, events and news, among others. This APP addressed to governments and businesses, has received the first prize (3,000 euros) of the Reuse Competition of Open Data Euskadi. Open Data awards aim to publicize the existence of Open Data Euskadi, promote the use of open data to create wealth and social value and know which data most demanded by those interested in data reuse are. 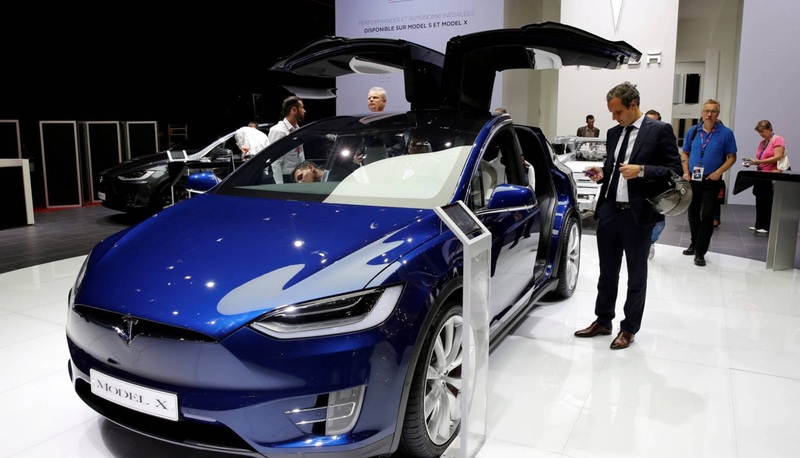 The executive reported Monday the winners in the two categories of the competition: apps and ideas. The first rewards the two best services, studies, web applications or mobile devices, which have been created from data from Open Data Euskadi. In addition to the 'Open Ispilu', the Basque Government has awarded a second prize (2,000 euros) application "Servirace, with the Runner's Guide", which uses open data to inform the nearest services to each career (hotels, restaurants…etc. ).